The third quarter held good news for the comics industry, with September’s five-week month boosting overall retailer orders of comic books, trade paperbacks, and magazines into positive territory for 2009. Click to see the estimates for the month. Direct-market retailers ordered about $6 million more worth of comics, trade paperbacks, and magazines from Diamond Comic Distributors than in last September; we’re ahead of last year overall by about $3 million, so this is the month that made the difference. We see resilience particularly in unit sales within the top-selling comic books list: The Top 300 is back over 7 million copies again, a 4% increase over the same month last year and a 12% increase in dollar terms. Trade paperbacks remained just slightly off within the Top 100, but the industry is ahead for the year once the Top 300 comic books are added to the total. The average comic offered in the Top 300 cost $3.44; the average comic ordered cost $3.48. It’s unusual for the weighted price to be higher than the average price offered; this comes from the heaviest-selling comics being priced more expensively. Indeed, we see that the average price of the top 25 comics is $3.55. $2.99 is still both the median and the most common cover price for comics in Diamond’s Top 300. What are the direct market’s chances for an up year in 2009? Last October was very strong, while last November was relatively weak. December was big, but not as big as October. We’re looking at an average of 7 million comic books a month just to stay even in the Top 300, meaning we need this September’s performance every month. We’re probably not going to wind up with more Top 300 comics unit sales this year unless we manage 8 million-plus a month; however, we’re well positioned for the Top 300 comics to end up ahead in dollar terms. Overall, my projection is for total orders to wind up around $430-445 million range; that’s a range that includes last year’s sales of $436.6 million. So without a serious collapse or explosion, we’re looking at an essentially flat year in dollar terms. We might be a point or two ahead or behind at most — which in 2009, seems like better news than we might have expected. September 2008's top seller was Marvel's Secret Invasion #6, with first-month orders of approximately 164,400 copies in the direct market, slightly fewer than the previous issue. Notably this month, Marvel topped 50% in the Final Unit Sales Market Shares for the first time since Diamond began printing final market shares. Check out the sales chart here. September 2004's top-seller was Superman/Batman #12, beating out titles in a month that included Identity Crisis and "Avengers Disassembled" with final orders through Diamond of 139,500 copies. It was a month with sizable increases year-over-year across several categories. Check out the sales chart here. September 1999's top-seller was Uncanny X-Men #374, with preorders of approximately 110,700 copies in the direct market. It wasn't as bad a month as some we'd seen in 1999; dollar preorders for the Top 300 comics were even slightly up in a month that included DC's weekly Day of Judgment. Again like I mentioned last month, the number of copies preordered of the Top 300 comics in September 1999 was almost identical to the number of copies ordered in September 2009. But it is important to note that does not mean that comics' reach is unchanged this decade; completely apart from the 33% more money that retailers received for that same number of comics in 2009, the market now includes something it didn't have in 1999: millions more trade paperbacks, circulating through comics shops and through mainstream bookstores where comics weren't as prominent back then. Check out the September 1999 sales chart here. September 1994 was ruled by a comic book with a cover price that looks right at home 15 years later: Marvel's Generation X #1, priced at $3.95. With a shiny wraparound cover, it was the top seller at both Diamond and Capital City Distribution, where it had orders of 124,200 copies. Overall sales were probably closer to half a million copies. It was an auspicious beginning, and Generation X would continue its run for several years, even inspiring a TV movie just a couple of years later — remarkably quickly, as media moved back then. Considering that the #2 comic book, Spawn #25, cost less than half as much and still sold 10% fewer copies, the performance of Generation X #1 seems even more remarkable. 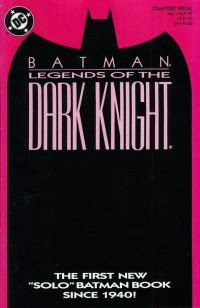 September 1989's top seller at Capital City, Diamond, and probably everywhere else was a landmark comic book: Batman: Legends of the Dark Knight #1, which I regard as the official beginning of the early 1990s comics boom. The first issue was so heavily ordered by retailers that DC, according to Maggie Thompson, grew concerned that retailers wouldn't be able to absorb the huge volume of copies they ordered. The publisher then spread the shipments out across four weeks, sheathing the issues in four different colored cover wraps — inadvertently providing fuel to the "variant cover" craze that followed. Capital's initial orders were astonishing for that day and time: 216,050 copies, meaning that with other distributors and the newsstand, LOTDK #1 is likely the first million-copy seller for the comics market in several years — perhaps even since the 1977 issues of Star Wars. Incidentally, not one of the four pastel-wrapped versions (which our collecting circle referred to as "the Crayola-covers: salmon, periwinkle, raw umber, and flesh") is worth more than any other today on the secondary market. My own survey of eBay five years ago found 70 copies in a one-day search. Finally, September 1984's top comic book was Marvel Super-Heroes Secret Wars #9, known colloquially as "the issue after the Spider-costume one." This report begins my fourteenth consecutive year of Diamond estimates; more to come, both looking back and ahead, in the future.